Thank you to all who attended yesterday’s tour of Karen & Darren Dageforde’s Net-Positive Energy Home! First of all, thank you to our hosts, Karen and Darren Dageforde and their son, Pierce: Karen for providing an excellent presentation on their all-electric home’s many green building and clean energy features, and to all three of them for providing individual discussions and tours afterwards. Karen also talked about their family’s commitment to saving energy, water and other natural resources and provded steps attendees can take in their own homes. Many thanks, too, to everyone who made the beautiful drive to attend the event, coming from Blair, Omaha, Bellevue, Lincoln, Council Bluffs and as far away as Seward! Built in 2010, the home’s features include a passive solar design; huge windows for natural lighting; insulated concrete-form floors and walls, which prevent air infiltration and loss, a major contributing factor to the typical home’s energy costs; Energy Star windows and Energy Star appliances; R-50 attic insulation; 5 closed-loop geothermal wells for heating, cooling and hot-water generation; a 5-ton HVAC system; radiant flooring that provides free cooling; and photovoltaic (PV) systems: 18 panels installed in July 2011 and 14 in May 2016. These were both do-it-yourself projects designed and installed by Karen and Darren. The total energy generated by their PV system in 2017 was 11,303 kilowatt hours (kWh), providing 100+% of their home’s energy needs! The cost of designing and building their net-positive energy home was very comparable to the cost of a conventional build. Karen, now retired, holds a degree in accounting, and Darren, director of utilities in UNMC Facilities, Management and Planning, has a degree in mechanical engineering. They are also volunteers at the Washington County Recycling Center, working alongside others to sort boxes of cans and bottles, paper and plastic. They and their son Pierce “walk the walk” in this area, too, in a variety of ways and encourage others to do so, as well, as they did yesterday, including: not only recycling but also purchasing recycled products; trading with others; buying in bulk, thus reducing packaging, and taking reusable, washable containers to stores, including mesh produce bags; and repurposing materials, as Karen and Darren did when they recovered lumber that had been thrown away to build their chicken coop. Each one of these steps conserves energy, water, and other natural resources over the manufacturing and use of new things. Following up on the Dageforde family’s inspiring presentation, handouts, and individual tours and discussions yesterday, the links to resources, below, provide additional information on energy conservation and renewable energy incentives for homes and businesses. OPPD’s interactive resource, “How to Read Your Bill” includes information on how to check your current electricity usage and compare it the previous year. 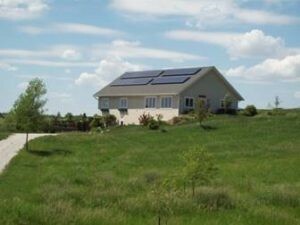 This entry was posted in Green Building, Nebraska / Midwest News, Solar Energy Education and tagged energy conservations steps, Karen and Darren Dageforde, Nebraskans for Solar NewsBlog, NFS-sponsored tours, renewable energy incentives, Solar Energy Resources for Nebraska Businesses, The Dageforde Net-Positive Energy Home on May 6, 2018 by Helen Deffenbacher.